Little girls learn to use monofins and tails safely. 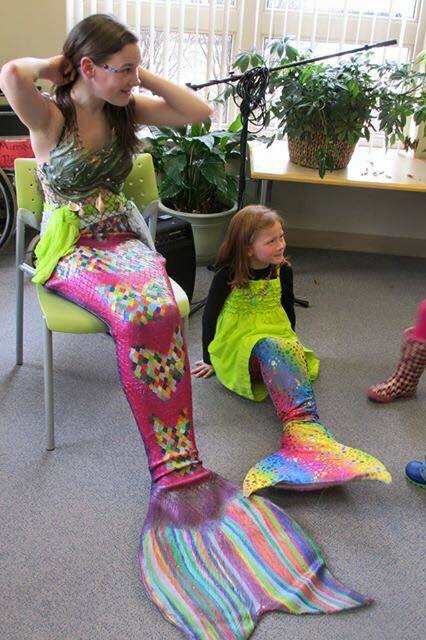 At Canadian Mermaids Inc. and Halifax Mermaids, we make safety a priority. We believe children learn the best through play and endeavor to use play based practices to empower them toward safer swimming habits. We practice safety in several ways and would like to share this information with you. Raina actually participated in the first published study on mermaid safety. You can read it here. 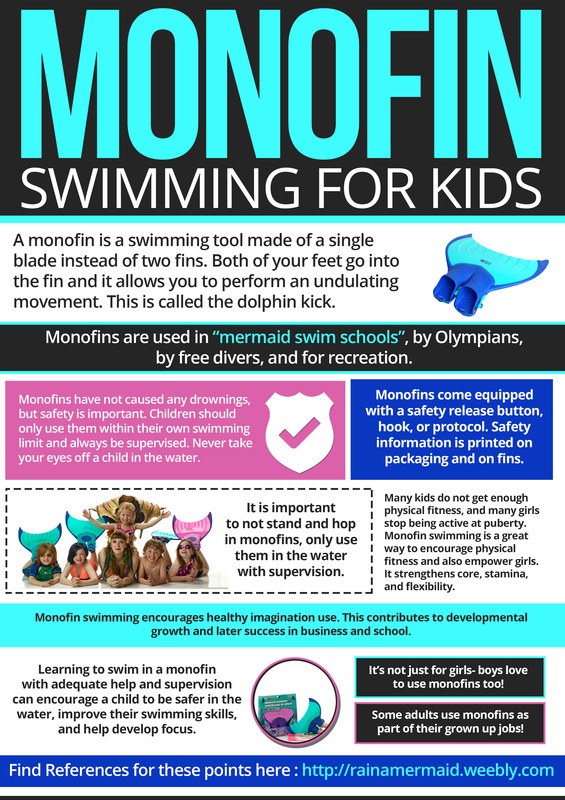 As mermaid monofins have grown in popularity, so have concerns around safety. A monofin is a single fin in which both feet are placed. The swimmer uses an undulating motion called the dolphin kick to propel themselves. This move is most frequently used by free divers, Olympic swimmers, and now… mermaids. The safety concerns are that the fin changes the way people can recover in an emergency, and require a skill set to remove during an emergency. The monofin changes the dynamic of recovery positions such as a back float, roll, or starfish that are commonly used when swimmers are tired. Some swimmers panic while wearing monofins as they feel it restricts their movements. How do we remedy those safety concerns? First it’s important that only established swimmers use monofins and tails without the use of a floatation device. Many pools and programs use a swim test to determine if a child is ready to swim with a monofin. Well known tail making company FinFun give an example in the video below. ​Next, it’s important to familiarize yourself with the safety release function on your monofin and be sure the child knows how to competently use it. Each monofin has a different safety release based on the make. This will be clearly labelled on the box, website, and sometimes on the fin. Most consist of a latch or strap that can be removed easily. ​Finally, it’s important to use common sense! Never allow a child to swim without supervision. As Finfun says “Know your limit, swim within it”. No standing and hopping in tails on the pool deck. Fins and tails are actually very light. They shouldn’t cause a child to sink or experience drag. It’s important to test that in the shallow end before moving to the deep end. Check out these safety infographics created by FinFun for the use of their tails! Monofins can be a great tool for children. They empower them toward physical fitness and can burn up to 500 calories in an hour. They encourage imagination- a vital developmental tool that will increase resilience and create lifelong coping skills. 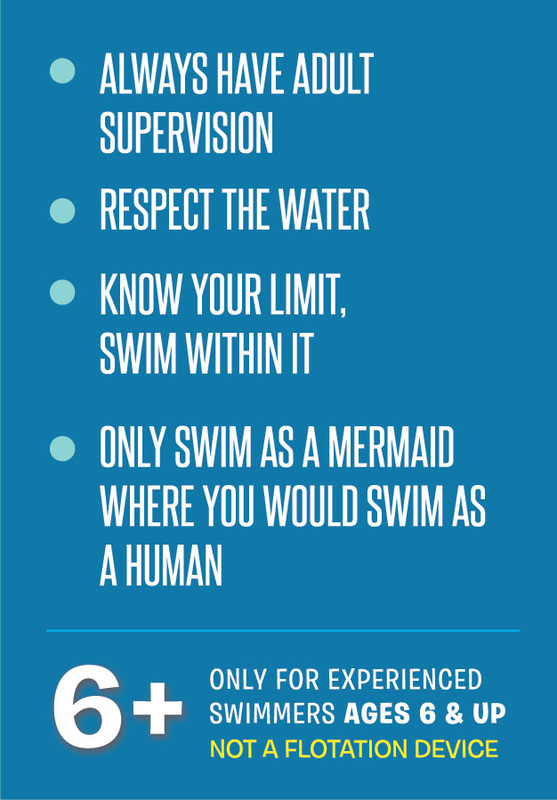 There is a lot that can be gained from a mermaid swimming experience, so long as it is done with adequate supervision and within a swimmers skill level. Know the safety release, and practice with your child. 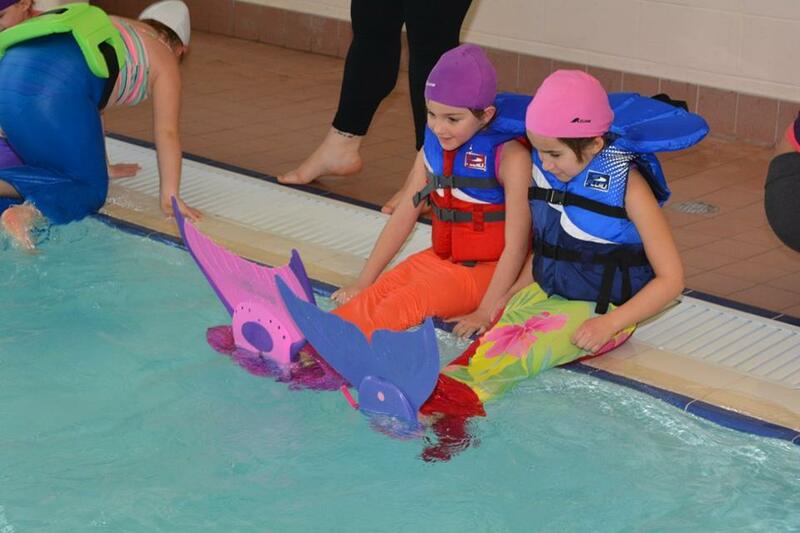 At Halifax Mermaids we also practice safe swimming. 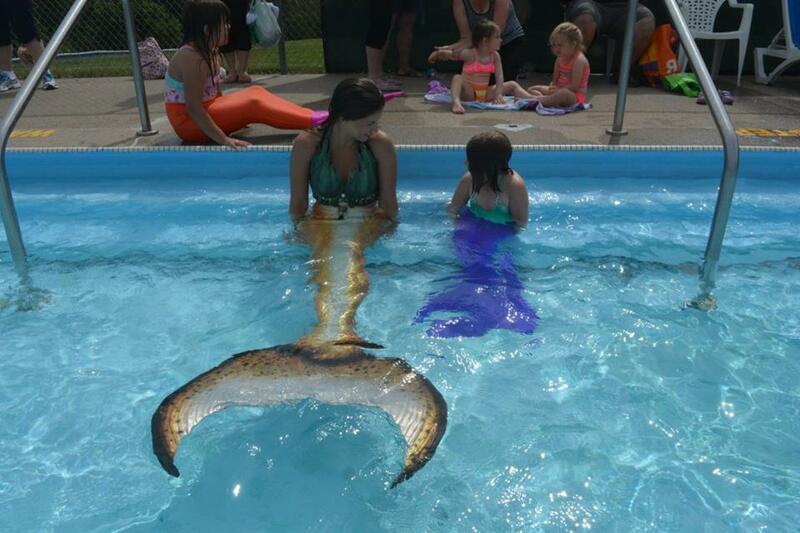 Our mermaids never swim alone, and our entire team has emergency first aid and CPR training. We are skilled professionals but often have rescue divers on hand for certain events, lifeguards, or trained professionals who can help us in an emergency. Even professional mermaids should never take risks!